Ok, so Mother Nature really threw us for a loop last Friday in our neck of the woods! Instead of having a gorgeous first day of Spring, we were blanketed with snow and forced to pull out those down coats and snow boots yet once again. And what a bummer! We had just put them away hoping to start wearing all of our new spring looks. With so many unbelievable trends this year, Mother Nature better start changing her tune so we have lots of time to wear each one. 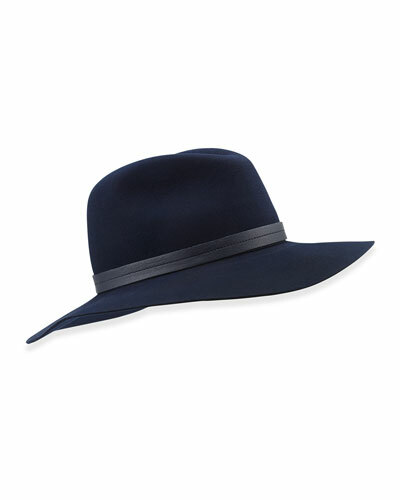 Take a look at some of our faves from all the hot Spring trends out there. 1. Whites! All whites! From bright whites to cream and everything in between! 2. The New Boho trend- where gypsy girl meets jet set lady. The more romantic side of the style in silhouettes appropriate for eveningwear. 3. 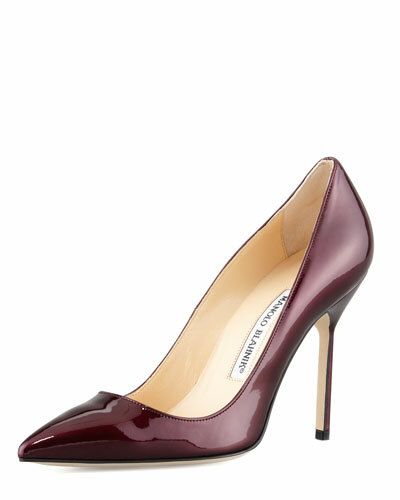 Marsala- the new color of the year as announced by Pantone. Marsala is an earthy wine red color, very rich and seductive. 4. Sleeveless jackets- the new layering piece. Very versatile, with an effortless vibe. 5. 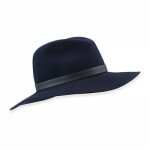 The wide brimmed fedora- a fresh take on the classic hat. 6. Fringe- on bags, shoes, and clothing. Fun and flirty. 7. The bucket bag- chic and practical. A roomy bag shaped like a bucket, with a drawstring closure. 8. 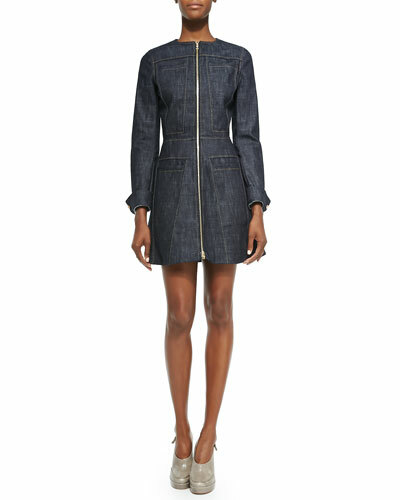 Denim – on all the runways, shown in new and refreshed silhouettes. 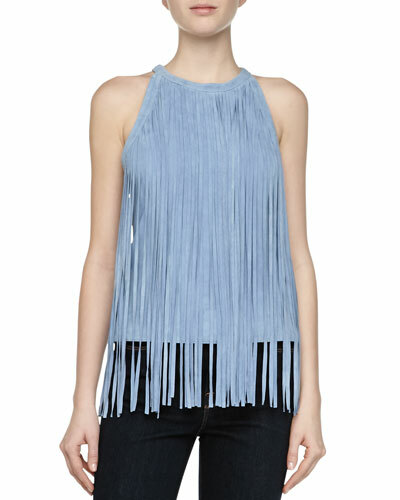 Many designers are even showing embellished denim for lots of fun and drama. 9. 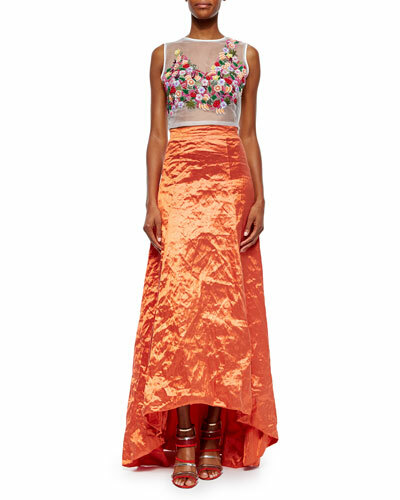 Two piece eveningwear- a crop top and long skirts are all the rage for formal affairs and the upcoming prom season. 10. 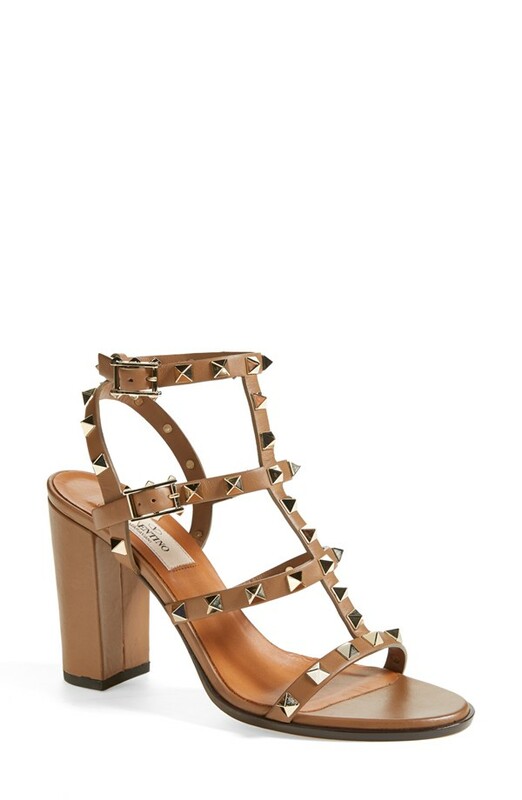 Block heels- designers are emphasizing comfort and ease while still looking chic with these chucky heels. Wishing you all a sunshiney, snow-free Spring!!!! Milan Fashion Week and A Tribute To Moms! So an early Mother’s Day present and tribute took place in Milan today. 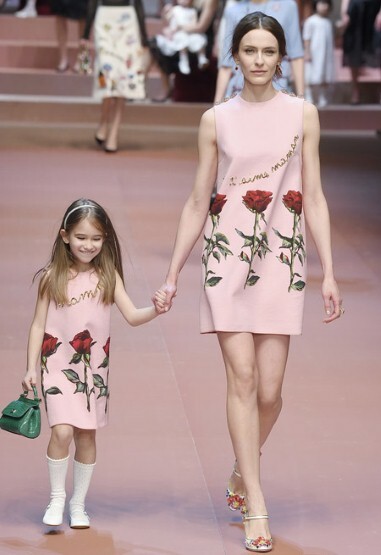 Dolce & Gabbana presented their Fall 2015 collection for Fashion week, with mothers to new babies, toddlers and those expecting rocking the runway. Drawings by the children of Dolce employees were printed on to silk. Embroidered messages, appliqued red roses and pretty jewels were on full display. The collection was a true celebration of family! 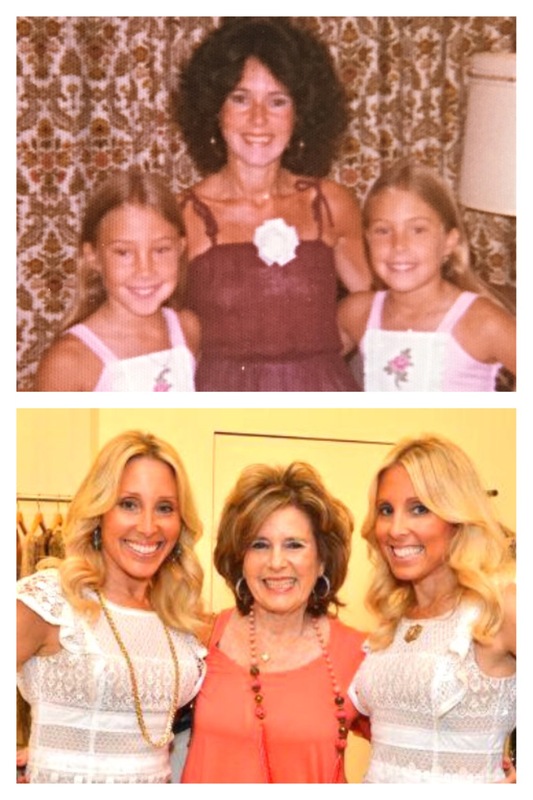 We too, have always felt that having a beautiful and stylish Mom taught us how to be stylish ourselves. We remember going into our Mom’s closet as little girls and marveling over her trendy clothes, designer handbags and her beautiful jewelry. 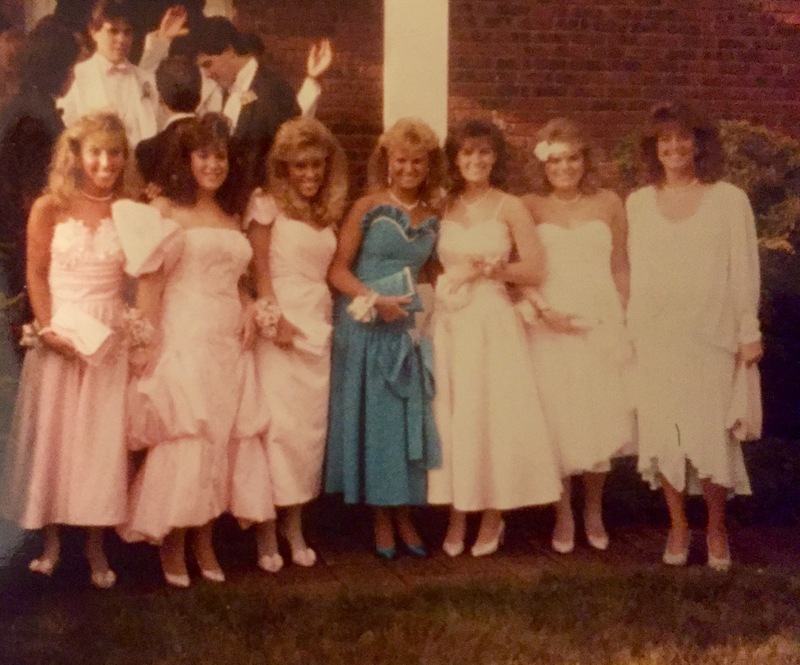 She always took the time to do her hair perfectly and loved to wear high heels for all occasions. She taught us to be devoted moms while still taking the time to treat ourselves to new shoes, bright lipstick and the perfect pair of jeans. There is something so wonderful about being a modern, multi-tasking mom! We can have a job, take care of a family, stay fit and healthy…all while looking fabulous!